from 3 pcs. 5,27 EUR ea. from 10 pcs. 4,91 EUR ea. from 20 pcs. 4,74 EUR ea. from 40 pcs. 4,59 EUR ea. 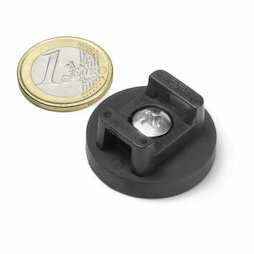 The rubberised neodymium pot magnets are designed to allow for cables, hoses or pipes in various diameters to be attached directly or through cable tie, string or nylon thread. The rubber coating increases the weight carrying capacity in shear direction and also protects fragile surfaces from scratches.